Hopes of finding more survivors after Mexico City’s devastating quake dwindled to virtually nothing Sunday, five days after the 7.1 tremor rocked the city. 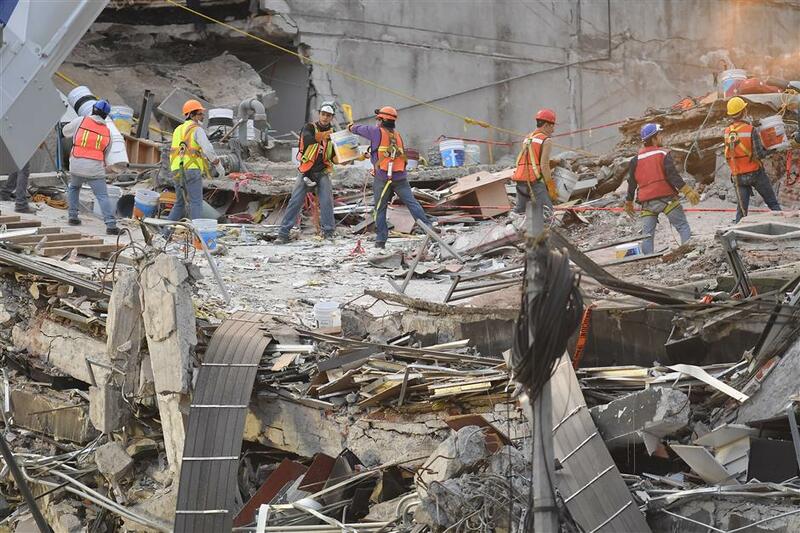 Rescue workers continue to dig into the debris of a flattened building in the search for survivors in Mexico City on September 24, 2017, five days after the powerful quake that hit central Mexico. Hopes of finding more survivors after Mexico City’s devastating quake dwindled to virtually nothing Sunday, five days after the 7.1 tremor rocked the heart of the mega-city, toppling dozens of buildings and killing more than 300 people. Yet authorities were still listening to anguished families who insisted that painstaking rescue operations continue at a handful of sites. Foreign teams from Japan, the US and elsewhere were working with dogs and Hi-Tech gear to try to detect signs of life under the rubble. In the first three days, 69 people were pulled out alive. But since Friday only bodies have been recovered. A series of smaller earthquakes in the south of Mexico on Saturday — including a 6.1-magnitude one that triggered seismic alerts in the capital — stoked panic in a population traumatized by Tuesday’s disaster. Authorities said two people died in the southern state of Oaxaca, where tectonic upheaval was centered. A bridge buckled and collapsed, as did several other previously damaged structures. In Mexico City, two women, one aged in her 80s, the other 52, died of heart attacks as they tried to evacuate their homes. Others prayed the rocking earth wasn’t going to swell into a new catastrophe. “Oh God, have mercy,” exclaimed Teresa Martinez, 74, who stood in the street with other women, all crying. The tremors — possibly aftershocks from a massive 8.2-magnitude quake that hit southern Mexico two weeks ago — forced rescue workers in the capital to pause their efforts for a couple of hours. They also underlined the historic vulnerability of the country to quakes, siting as it does on several tectonic plates. No citizen has forgotten a 1985 earthquake that killed 10,000 people in Mexico City. But some of the families hoping against hope to see trapped loved ones again also clung to memories of “miracle” rescues in 1985 that happened a week after that quake. Experts say that, usually, there is little to no chance of finding quake survivors after three days have passed. Nevertheless, the smell of decaying bodies wafting out from collapsed buildings presaged grief for some relatives. Rescue workers wore face masks to shield themselves from the odor. But some of the foreign crews sent to Mexico on hasty rescue mission refused to call it quits. “We’re here to save lives. You have to have faith and believe (the people inside) are in a place with access to air and managed to survive,” said Karin Kvitca, a 29-year-old with an Israeli rescue crew. So far the foreign specialists have found only bodies. At one point, Japanese rescuers were seen removing their helmets and bowing before a recovered corpse. The latest death toll stands at 307, of which more than half — 169 fatalities — were in Mexico City. One of the most poignant scenes in the city was white wreaths laid at what used to be a school in the south of the capital where 19 children and six adults died. An 8-year-old boy recovered alive was in an induced coma in hospital.